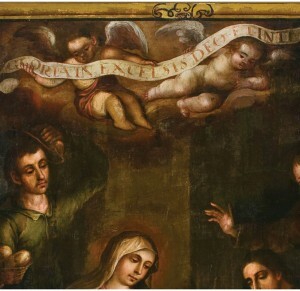 The reappearance of Juan Correa’s 17th-century painting The Nativity in the Palace delighted many of us. (See the original post, below.) But a few of us were puzzled by something in the painting. And it didn’t help that our Latin runs a gamut from rusty to non-existent. Two cherubs hover near the top, holding a banner bearing a Latin phrase. The words? Most of us could make out “Gloria in excelsis Deo,” but were then stumped by what appears to be “E Tinti” or “F Tinti” or maybe “E Tinto.” “F Tinto”? Was it someone’s name? A colonial version of dead-language name-calling? A 1600s version of Pantone color names? Ah. Thanks, Josef. Handel wrote a version. So did Vivaldi. For the meditative enjoyment of all, here’s J.S. Bach’s version of the hymn from his Mass in B Minor. Early craftspeople couldn’t pick up a baseball cap with a cute logo for protection. They had to rely on what they could find lying around. For those working in print shops, where the air turned into an inky, messy mist when the presses rolled, the one thing they had plenty of was paper. Made from a mysterious maze of about, oh, 20 folds, the hats protected at least the tops of their heads from those hard-to-wash drips and drops. Each year, the Palace of the Governors’ Press, with volunteer help from the Santa Fe Book Arts Group, makes a few hundred of the hats to delight children and adults alike during the annual Christmas at the Palace event. This year, Xmas@Pog, as some of us short-hand it, celebrates its 25th anniversary on Friday, Dec. 11, from 5-8 pm. Besides snagging a hat, you can tour the Press, which was closed for renovations last year, and print your own holiday card on one of the antique, hand-operated presses. And, thanks to a new video made by Leech and Museum Resources Division Graphics Director David Rohr, you can learn how to make one of your own. The hats weren’t the sole province of printers, as an admittedly lazy bit of Internet research tells us. Carpenters, stonemasons and painters may have also used them. An illustration by Sir John Tenniel for Lewis Carroll’s The Walrus and the Carpenter shows said carpenter with a printer’s hat atop his head. Something called The Hat Museum in Portland, Ore., has an example of one. 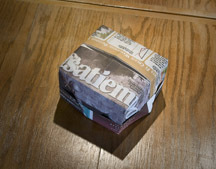 And if you’d rather have a printer’s hat that looks suspiciously like a bishop’s mitre, you can fold it that way, too. For those of raised on twice-a-day newspapers, who love the feel of newsprint and the snap it makes as you reverse its fold to get to the crossword puzzle, printer’s hats are something of a delicacy, one we’ll decidedly miss should our cherished dead-tree news ever completely give way to our newly beloved blogs. A beautiful example of 1700s fine art came out of the closet this week for a special holiday showing at the Palace of the Governors. This week, movers placed Juan Correa’s painting The Nativity (otherwise known as THE mother and child) on a wall in the main entry of the Palace. 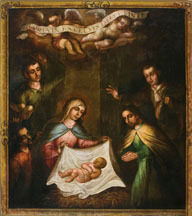 Part of the New Mexico History Museum’s Iberian Collection — 70 paintings and three bultos from 17th- and 18th-century Mexico and South America — The Nativity was one of several canvases that once formed an altar screen dedicated to the Virgin Mary. The screen itself was probably 25-35 feet high and 20 feet wide. Its painter was one of the masters of the Baroque painting period in Mexico. He was born to a prominent mixed-race physician from Cádiz and a free black woman from Mexico City. He and his workshop were extremely productive and produced countless pictures. He had several prestigious commissions that spanned the Spanish colonies. Altogether, the Iberian collection includes master artists such as José de Páez and José del Castillo from Mexico, and Diego Tito, an Incan painter from Peru. Several years ago, the collection was donated to the Palace of the Governors. The needs to conduct conservation work on the pieces, as well as the Palace’s comparatively tight spaces, have delayed their display. But, for now, and at least for awhile, Correa’s Nativity spreads its rich warmth. Enjoy it during Dec. 11’s Christmas at the Palace event. Combine it with a quiet, meditative visit to the Tesoros de Devocion exhibit, also in the Palace; Tesoros celebrates the artistry of New Mexico’s own santeros. The holiday season can be rough-and-tumble and too often focused on spending and shopping. Feed your soul instead. We have a few ways up to do so – and you deserve each and every one of them.